A vote to overturn a Trump executive order on low-cost insurance plans failed but Democrats believe the issue will help them in November. WASHINGTON — Just four weeks ahead of the midterm elections, Senate Democrats sought to turn the focus back to healthcare by forcing a vote Wednesday to overturn President Donald Trump’s executive order that allows for the sale of low-cost, low-coverage health insurance plans. The proposal, offered by Sen. Tammy Baldwin, D-Wis., was an attempt to spotlight the Republican Party’s drive to unravel the Affordable Care Act and return focus to an issue that Democrats believe is a winning one. "The Senate will have an opportunity to undo a portion of the Republican campaign to sabotage health care," Senate Minority Leader Chuck Schumer, D-N.Y., said on the Senate floor Tuesday, ahead of the vote. "And in November, the American people will have a golden opportunity to move our country in a dramatically different direction, by voting for Democratic candidates who will work to improve our health care rather than so many of those Republicans candidates who in obeisance to the big insurance companies, work to destroy it." Two Republican senators who voted against the repeal of the Affordable Care Act in 2017 — Lisa Murkowski of Alaska and Susan Collins of Maine — were seen as potential swing votes given their concerns for patients with pre-existing conditions not having adequate access to insurance coverage. Murkowski voted against the proposal, while Collins sided with Democrats in support of it, causing the vote to fail, 50-50. Trump in June ordered the Department of Labor to allow for the sale of "association health plans," which allow people to group together and purchase cheaper health insurance coverage. Such plans are cheaper because they provide less coverage, circumventing requirements in the Affordable Care Act that mandate that health insurance plans cover “essential benefits,” such as mammograms and maternity care. Critics say the health plans also gut protections for pre-existing conditions. Democrats are trying to turn attention to health care after a brutal month in which the confirmation battle of Supreme Court Justice Brett Kavanaugh dominated news cycles, increasing previously apathetic Republican voter enthusiasm, according to party operatives. Republicans are so confident that the Kavanaugh fight has helped their chances of retaining control of the Senate in the midterm elections that Majority Leader Mitch McConnell, R-Ky., spent time on the Senate floor this week revisiting it. "The all-consuming animosity towards this nominee, independent from all the facts and evidence," shows that "the far left mob is not letting up," McConnell said Tuesday. "Fortunately the American people know that the fact-free politics of hate, fear and intimidation are not how we actually govern in our democratic republic." Sen. John Cornyn, R-Texas, said Republicans are on the right side of this health care issue because the low-cost plans enable consumer choice. And, he said, the Kavanaugh fight taught Republicans a lesson. "When Republicans have the courage of their conviction and they make the arguments that we can win these arguments. We can't be intimated by the opposition," Cornyn said. "If we explain our position, then I think we will win." Ten Democratic senators are up for re-election in states that President Donald Trump won in 2016, and a handful of them are especially vulnerable. The confirmation battle over Kavanaugh has put many of those Democrats, who have been trying to show independence from their party, in a challenging position so close to the election. A return to the health care debate may be helpful to them. Polling has consistently shown that health care is one of the top issues of concern to voters. A September NBC News/Wall Street Journal poll found that 76 percent of respondents said health care was the most important issue to them. "Whether it’s their legislative agenda, the lawsuit that GOP candidates like (Missouri Republican candidate) Josh Hawley signed onto to gut coverage for pre-existing conditions, regulatory sabotage or junk insurance plans, Republicans keep demonstrating they are on the wrong side of voters on the most important issue they care about," said David Bergstein, a Democratic Senatorial Campaign Committee spokesman. "Democrats are leading the charge to focus on something that voters are actually concerned about and have been all cycle long." Baldwin who is running in a relatively tight re-election bid and is leading the effort on Wednesday’s vote, used a rare procedural tactic that allows the minority power to force the vote to overturn a president’s executive order. "Anyone who says they support health care coverage for people with pre-existing conditions should support this resolution," Baldwin said in a statement. "This is an opportunity for Democrats and Republicans to protect people’s access to quality, affordable health care when they need it most." Baldwin's GOP opponent Leah Vukmir responded to the move, saying, "as a nurse, I support giving Americans more choices in health care because the people know best, not the government. 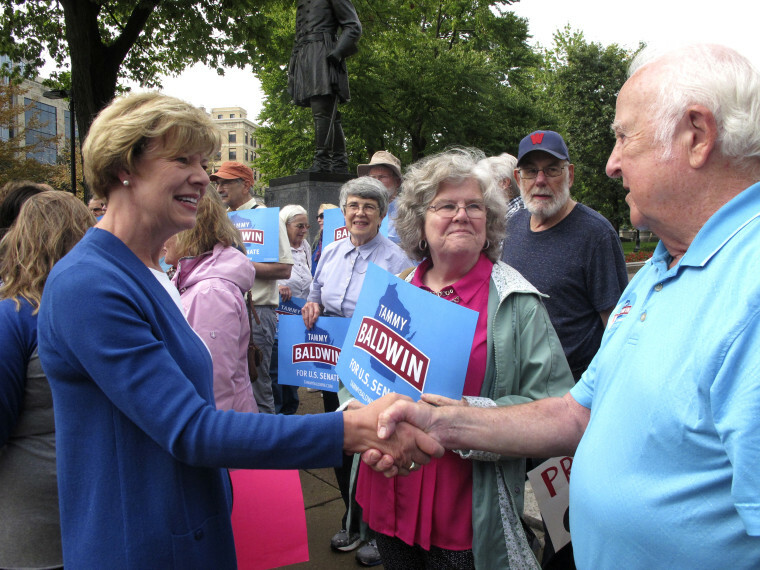 On the other hand, Senator Baldwin — who supports eliminating Medicare, Medicaid, Tricare and all employee health insurance — arrogantly says she knows better than Wisconsinites about which health plan they should buy, calling their decisions to purchase affordable insurance 'junk.'" CORRECTION (Oct. 11, 2018 3:58 p.m. ET): An earlier version of this article misidentified Sen. Chuck Schumer, D-N.Y. He is the Senate minority leader, not the majority leader.